Unfortunately the "Free Pledge Surface Cleaner" offer is no longer available. Pledge Multi Surface Everyday Cleaner does the work of a variety of household cleaning products. This all-purpose cleaner contains a worry-free formula that cleans up smudges and messes while safely leaving the finish alone. Pledge Multi Surface Everyday Cleaner also removes dust and up to 90% of the allergens found in dust. 2. Once logged in, click the "Get Offer" button and you'll be directed to Walmart to make your purchase. 3. Add one (1) Pledge Multi Surface Antibacterial Everyday Cleaner 9.7 Ounces, (Pack of 2) priced for $7.47 to your cart and checkout. Do not add anything else to your cart. 5. 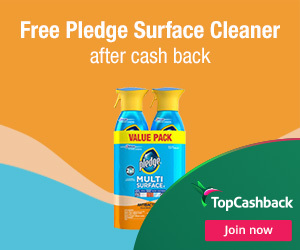 In about 14 days $7.47 will post in your TopCashback account. Offer valid through December 1, 2018.